﻿ Real Madrid 8-0 Malmo. Ronaldo "pokerizes" another record! 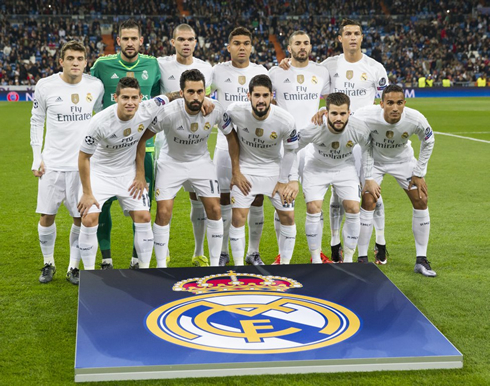 08.12.2015 » Real Madrid 8-0 Malmo. 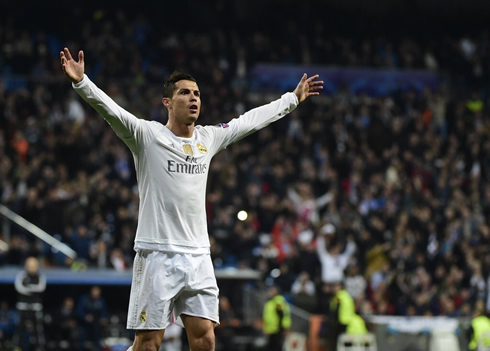 Ronaldo "pokerizes" another record! Real Madrid were already through to the knockout stages of the UEFA Champions League, but that didn't slow them down tonight against Malmo, as they hosted and crushed the Swedish side in a 8-0 win. Cristiano Ronaldo with 4 goals, Benzema with 3 and Kovacic with his first goal ever for the club, all wrote their names in the score sheet. The Santiago Bernabéu was the center stage for the biggest thrashing in the Champions League this season, as Real Madrid trounced Malmo in a 8-0 victory and finished their group stage campaign in the first place of Group A, 3 points on top of PSG. The man of the match award goes once again into Cristiano Ronaldo's hands, in a night where the Portuguese forward scored a poker (4 goals) and broke the record for the most goals ever scored in a Champions League group stage (11). Benzema stood right behind him in the score sheet, scoring a hat-trick and his 5th goal in the last two games for the Merengues. Kovacic sealed the win with the last goal in this match, setting the final score in an impressive 8-0 win. Real Madrid may have just had a therapeutic win tonight against Malmo, as they finally managed to score more than 4 goals in a single match, something which hadn't happened since September 12, when they beat Espanyol 6-0 in Barcelona. Their opponent this Tuesday night wasn't exactly the kind of opposition that the Merengues can expect to face in the next stage of the competition, but still, it's not every night a team can score 8 goals in a Champions League game. Real Madrid are now through to the last-16 stage and Rafa Benítez's men didn't need to sweat much in order to advance in their group. In a game where we basically ended up seeing only one of the sides attacking the whole time, Madrid would break the deadlock near the 12th minute. Cristiano Ronaldo crossed it from the left, Isco had a first attempt cleared off the goal line and then Benzema easily finished it off with his left to put his team on the lead. The second goal turned out to be quite similar actually, with Ronaldo running with the ball down the right wing this time, assisting Benzema on the far post and the Frenchman heading it into the back of the net to make it 2 for "Los Blancos". The 6th goal of the game and Ronaldo's 4th on the night happened shortly before the first quarter of an hour of the second half had gone by, in a well designed play by Isco down the right wing and which ended up with the Spaniard assisting CR7 for a perfect 1-touch finish. The Real Madrid superstar had just reached the 11-goal mark in this Champions League group stage, wiping out his previous record of 9 goals, which had been accomplished in the 2013-14 season. 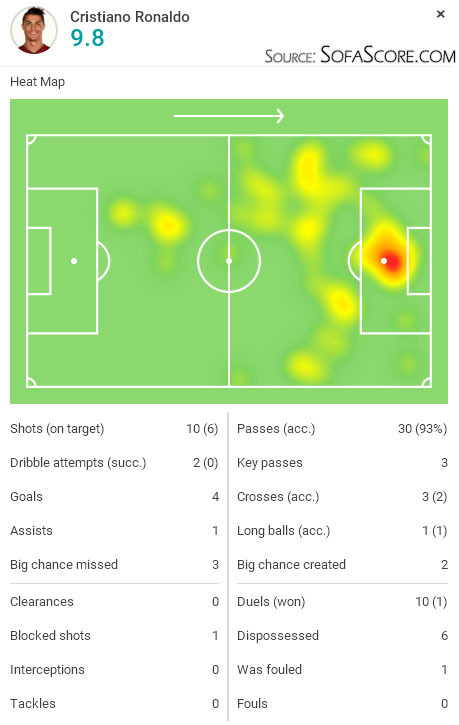 Malmo's beating wasn't quite over yet though and the Spanish giants added a 7th blow in Malmo's pride in the 70th minute of the game, when Mateo Kovacic made the most out of a rebound inside the visitor's box, scoring his first goal ever for the Merengues. The final score was set by Benzema in the 78th minute, as the Frenchman got rid of a defender before slamming it home for his hat-trick and for Real Madrid's 8th goal on the night. Cristiano Ronaldo next game will be for Real Madrid on the 13th of December of 2015, against Villarreal. You can watch Juventus live stream, Villarreal vs Real Madrid, Bayer Leverkusen vs Barcelona, Chelsea vs Porto, Olympiakos vs Arsenal, and Dinamo Zagreb vs Bayern Munchen, all matches provided from our streaming live football game pages.